What's Next for the Future of American Innovation? 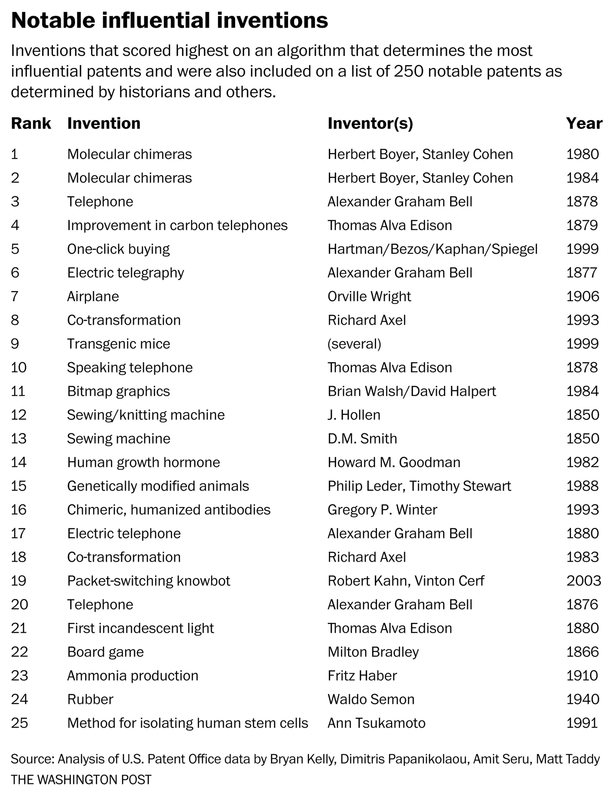 The third and largest wave of American innovation is drawing to a close, according to an ambitious and inventive effort to identify the most influential inventions of the past 180 years. To produce a consistent measure of U.S. innovation, economists built a database of more than 9 million patents. They cleaned the text and applied an algorithm which eliminated common words and outliers. Each burst of innovation was shaped by an unusual and dynamic chapter in the nation’s history. To compare them, the researchers pinpointed super-influential patents whose text looks nothing like earlier patents, but which predicted the contents of patents that came later. Like the electro-magnetic motor patented in 1888 by Nikola Tesla or the nylon fiber patented by DuPont chemist Wallace Carothers in 1938, such inventions break from historical precedent and introduce ideas and language which are copied and enhanced by others. Innovation defies measurement. It’s intangible. But economists continue to try because innovation helps determine productivity, and productivity helps determine economic growth. Previous attempts to compare innovation across eras counted patents or patent citations. Such counts are easily distorted by corporate practices or a patent clerk’s quirks. Patents rarely cited other patents prior to 1946. An early telegraph patent earned almost no citations, yet it’s not unusual for modern patents to rack up hundreds or even thousands of citations. The new analysis was released as a National Bureau of Economic Research working paper by Bryan Kelly (Yale School of Management), Dimitris Papanikolaou (Kellogg School of Management, Northwestern University), Amit Seru (Stanford Graduate School of Business) and Matt Taddy. Taddy now works at Amazon, an online retailer whose founder and CEO, Jeffrey P. Bezos, also owns the Washington Post. 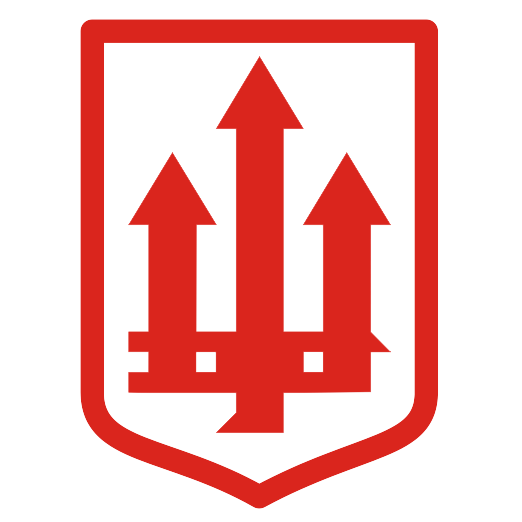 The team’s database begins in 1836. Earlier records were destroyed in December of that year when the hotel housing the U.S. patent office, one of the only buildings spared by the British in the war of 1812, went up in smoke. Casualties included fan favorites such as Eli Whitney’s cotton gin (1794), Cyrus McCormick’s reaper (1834) and Samuel Colt’s revolver (1836), none of which could be included in the study. The algorithm requires five years of data from both before and after a patent’s issuance. As a result, the researchers only rated patents issued between 1840 and 2010. Their text-similarity measure compares favorably to current methods. It correlates with citation-based rankings when they’re available and tends to give higher ratings to prominent patents on lists such as those compiled by Patent Office historians. Unlike citations, the algorithm can compare patents across eras. Unlike historians, the researchers algorithm can review the text of millions of patents at a time. 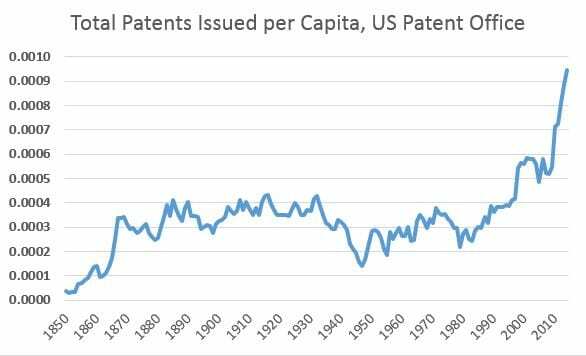 A simple count of patents per person appears flat for most of U.S. history, but such a measure is distorted by innumerable incremental advances. 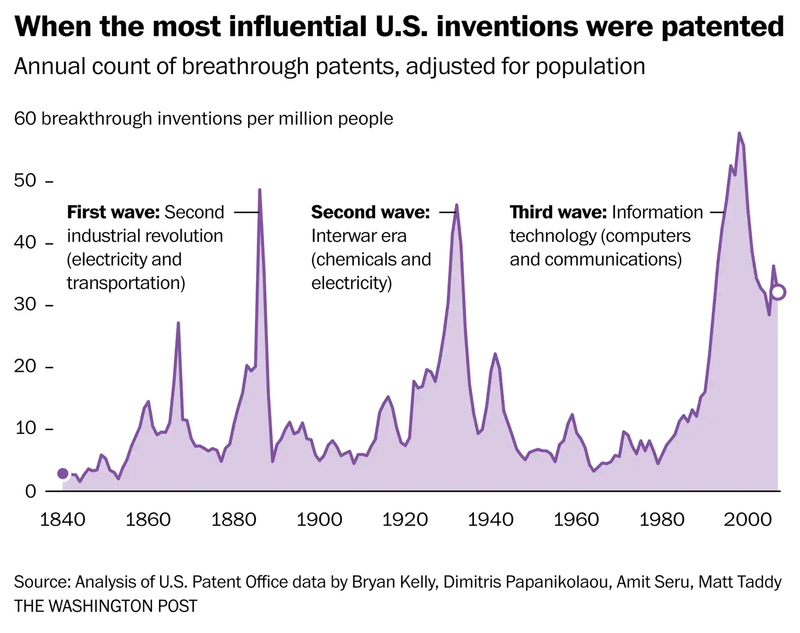 Sharp peaks and valleys emerge once researchers consider only the most-influential patents. “Most people wouldn’t think of a decade in which the unemployment rate was over 10 percent as being a likely candidate for a lot of technological advances,” Field said. Field argues the innovations of that era, particularly in civil engineering and the powerful railroad industry, laid the groundwork for the country’s rapid industrial and economic expansion during and after World War II. Their algorithm was designed to detect trends at the industry level, but we can also use it to pick influential individual patents out of all those issued since 1836. There will be some noise. The same is true of citation-based and qualitative measures, Papanikolaou said. Modern inventions often require dozens or even hundreds of patents, and its not always possible to determine which of those best represents a drug, smartphone or jumbo jet. To eliminate the noise from a list which might otherwise place pharmaceutical formulations and cryptography methods next to skateboard components, we combined their algorithm with a list of about 250 historically important patents compiled by their research team. The items listed below fell within the top 0.5 percent of all patents the team rated and have been listed as notable by human experts. The researchers found a strong relationship between a company’s portfolio of most-influential patents and its market value. The most influential firm in their dataset was International Business Machines. IBM issued about three times as many breakthrough patents as its nearest competitors, AT&T and Motorola. To be sure, patents don’t capture all the innovation happening in a firm or industry. NYU Stern economist Petra Moser found in a widely cited analysis of two nineteenth-century world’s fairs, published in American Economic Review, that the patent system itself can influence the distribution of innovation across industries. She has also observed that much innovation occurs outside the patent system. In the current era, gene splicing patents laid the groundwork for companies such as Genentech. Herbert Boyer, who pioneered the methods canonized atop the most-influential patent list alongside academic Stanley Cohen, founded the biotech firm in 1976. Boyer and Cohen’s work with recombinant DNA is typical of the modern wave of American innovation, which leans heavily on software and bioscience. That wave appears to have crested. Fewer influential patents have been issued almost every year since 1998. There may be a silver lining for those concerned about the nation’s long run of low productivity. Economists have long quantified the productivity of workers and machinery, but they struggled to measure the gains provided by new inventions. By measuring innovation, researchers hope to gain insight into one of the hardest-to-measure components of economic growth. In their research, Papanikolaou and his colleagues found it takes years for America’s inventiveness to be reflected in the country’s economic output. “Years where there was a lot of innovation tend to be followed by periods of high productivity growth,” Papanikolaou said. Even on its downslope, the third wave of American innovation could continue to pay dividends.